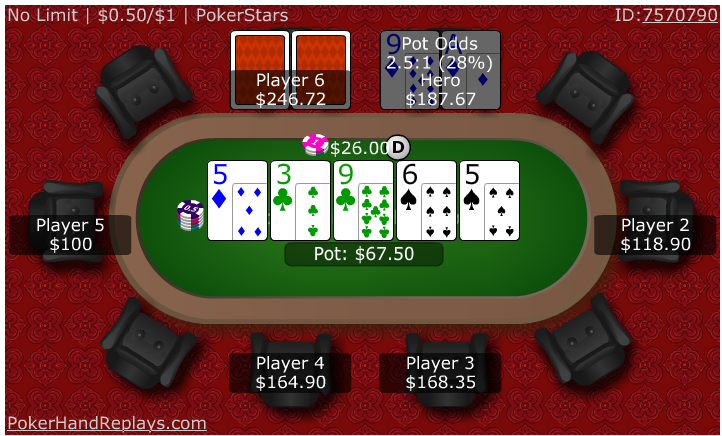 Pot odds, equity and expected value are important interrelated concepts in poker. As a beginner it is important that you understand the basics if you want to get ahead of your opponents. The math side of poker is often ignored by a lot of new players but by simply spending a bit of time learning these simple concepts you will be able to improve your game drastically. So we will first go through each of them individually and then a full example to tie it all together in the next few articles. Why Are Pot Odds Useful? 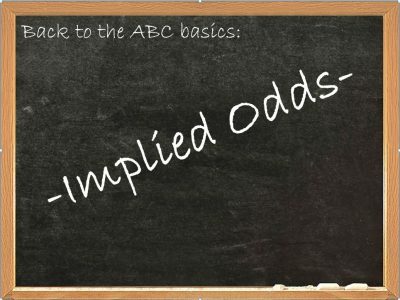 The odds which are being offered to you when your opponent bets are called pots odds. Essentially it is how much you will win vs how much you have to risk – your risk to reward ratio. This is particularly useful when in a situation where you’re facing a bet with a drawing hand (such as a flush draw). 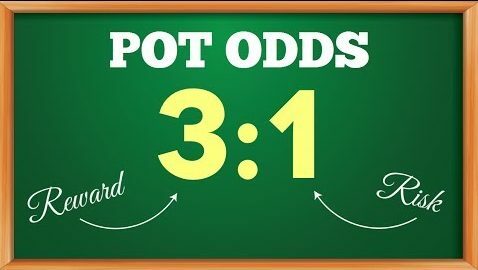 Pot odds will tell you whether is it correct for you to call or fold based on what size our opponent bet and how many cards that will improve our hand. We can also use pot odds to determine whether or not we can call a river bet based on how often we expect our opponent to be bluffing. On the river our opponent bets $26 into a $41.5. If we called would be risking $26 and our reward is $41.5 already in the pot plus our opponents bet of $26. This means that we are getting odds of 67.5: 26 (67.5 = 41.5+26). This is approximately 2.6:1. We can also convert that into a percentage (percentages are typically more intuitive) the result is 28%. So if we expect to win 28% of the time or more we can call profitably. How did we get that number? It first lets us determine our risk to reward ratio. We can then use this along with the strength of our and our opponents potential hands in order to make better decisions. If we have a very weak hand we should not be willing to call very large bets, only smaller bet sizes; in other words we must have very good pot odds in order to call. This makes sense – if someone was to bet $1 into a $100 pot on the river we will continue with almost all of our range. The greater the pot odds (the smaller our opponent bets) the more likely we should be to continue with our hand. Conversely, the smaller the pot odds (the larger our opponent bets) the less likely we should be to continue with our hands. The larger our opponent bets the more the requirement for an extremely strong hand. 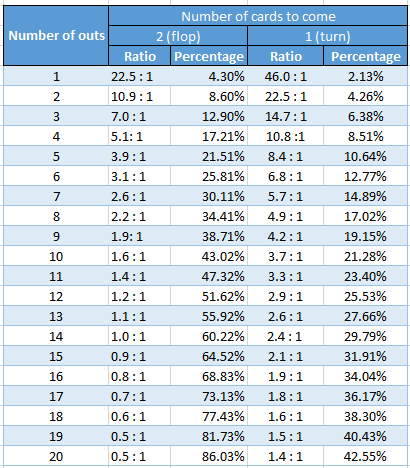 Implied odds is simply the additional chips we expect to win when we hit our hand. For example if we were to hit a flush on the turn or river, the hand won’t just end – we still have an opportunity to win more money from our opponent. This will reduce the pot odds we need to call profitably. The exception to this is when our opponent has pushed all in – we call we cannot win any more chips. The reason we call preflop with small unpaired hands is not because we expect to have the best hand all that often; but because we expect to win a large pot when we hit a big hand such as three of a kind. The reason we call is because with a hand like three of a kind, we have large implied odds and if we hit our hand we expect to win a big pot. The reason you go to College or University and get a degree is not because of the return you would expect immediately after graduation. It is because of the additional value a degree would bring you in the years after gradation through income, job opportunities etc. The same applied to poker. Unfortunately implied odds cannot be directly calculated like pot odds – we have to guesstimate the amount our opponent will be willing to pay us off after we make our hand. If we think our opponent has a very strong hand, and we stand to make a better one, we will have large implied odds. If our opponent has a weak hand, we will have little implied odds. Additionally, if we believe our opponent is a very bad player we will usually have large implied odds as he will be more likely to make mistakes and pay us with hands that he shouldn’t have. Finally, if he is a good player we will have significantly less implied odds. However, on of the best pieces of software you can use in conjunction with calculating pot odds from cardschat.com. This piece of software can be used to work out your pot equity which we have discussed in detail in other lessons. 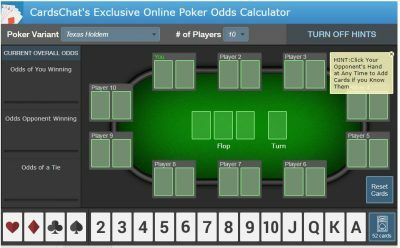 You should now be able to work out pot odds and when coupled with our other lessons, you should have a basic grasp on the math of poker.